This week, Christina and Ichose an all feminine topic for our challenge: sparkles and bling. This is quite a challenge for me! Remember, I had vowed not to fall into girly stuff! Since those times, lots of water passed under the bridge, and Thank God! cause, I love girl stuff! My dear friend Cathy Lynn had offered me the image of Tilda with cherry, I had planned creating a card for the Fruity challenge we had a few weeks ago. Everything went wrong, and the image sat on my table all this time, until, suddenly the inspiration came! I may be rather discreet on the bling & sparkles, but, I think my little Tilda is quite girly! Notre thème de défi cette semaine en est un tout féminin: Brillant et accessoires! C'est tout un défi à relever pour la fille qui avait juré qu'elle ne succomberait pas à la tentation des flafla féminins. Mais depuis, beaucoup d'eau a coulé sous les ponts! et Dieu merci! J'adore! J'ai choisi une image de Tilda with Cherry, offerte par ma bonne amie et co-équipière Cathy Lynn, que j'avais colorié pour le défi Fruity, où l'inspiration n'a juste pas été au rendez-vous. Cette image est restée sur ma table jusqu'à ce que je me lève avec l'inspiration. Je crois que ma petite Tilda est vraiment Girly, bien que je sois un peu réservée sur les blings et les brillants! I would like to invite you to visit my very talented friends and teamates, Christina , Cathy Lynn and Rene . Next week our theme will be Vintage Christmas. 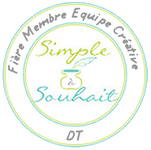 J,aimerais vous inviter à visiter mes amies et compagnes d'équipe, Christina et Cathy Lynn, et Rene . La semaine prochaine, notre thème sera Noel à l'ancienne. I used 3-D dots to give dimention to Tilda on the swing. Your design, dear friend, is brilliant!!! Love it! Love EVERYTHING about it! Tilda is colored to perfection...what a wonderful scene you created for her! This is oooooooooh so pretty!!!!! Tilda looks wonderful...what GORGEOUS coloring and she is surrounded by so much yumminess! Love the leaf vine and her swing and the butterfly and the fence and...oh jeez, I could go on and on! Good morning Danielle! This is PERFECT!!! So much beauty to look at and you definitely nailed this challenge. 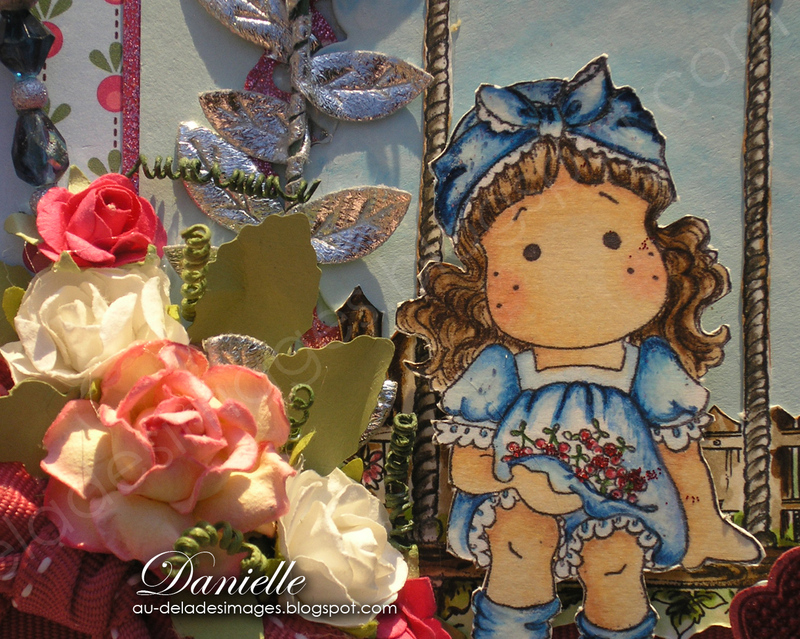 I love the combination of your stamps and all of your embellishments! Such pleasure for the eyes!!! Love the Dp's too! Your coloring is magnificient as always! Thank you for the inspiration! I love this card. It's so cute and lovely. Wow danielle this is gorgeous!!!! Your coloring is amazing!!! !What a stunning card!!!! Very pretty Card! I like all the extra embellies you added! Very nice. Tous les petits détails sont à couper le souffle...que d'imagination!!! Oh, Dani, this is gorgeous! I love all the girly stuff you've added to the card - it's just so pretty! Gorgeous sketch for showcasing Tilda and you've colored her so beautifully! I love the flowers and pretty pin and the little fence behind the image it's all so cute. Fabulous job on this challenge!!!!! Beautiful creation, all the elements work perfectly together. I love it. C'est magnifique, Danielle! I love all the interesting layers you have incorporated. Your coloration is spot on. It's girly, frilly, and perfect! Love it! Le féminin te vas à merveille Danielle. L'étiquette sur ta carte ma convaincu je veux le jeu d'estampe et le poinçon qui va avec.En plus d'être une bonne créatrice, tu t'en viens pomal bonne vendeuse! hihihi. WOW! How I love this beautiful card. The colours and your design are gorgeous! I love the beautiful details! Thank you for joining us at our Challege #6 at TOMIC. Elle est super mignonne ta petite tilda qui se balance Je l,ai moi aussi la fameuse balançoire il faut juste que je me décide on a toujours plein d'idées c,est juste qu'on veut tout faire en même temps! LOL! Beautiful card. Love the layout and all the embellishments. Oh Danielle!!!!!!!! This is ABSOLUTELY POSITIVELY GORGEOUS! Tilda looks perfect on that swing and your flowers and stickpin is sOooOo beautiful!!!! Ohohohoho and that butterfly at the top .. I love it!!!! FABULOUS as always!!! Such a pretty card! Love all the embellies! Tilda looks so peaceful! Your card is so beautiful. It evokes real emotion and pulls you into the scene. Great job! Beautiful card, i love the flowers you have used, in fact all your embellies are perfect, thanks for joining us at bling it on this month. Ta petite Tilda a l'air bien heureuse dans ce joli jardin remplie de fleurs! Une carte très "girly" et qui a tout son charme! 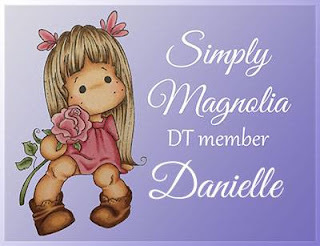 Wow Danielle, your card is SO pretty! I love all the different images you used to create this fun scene, and your DPs are lovely as well as your coloring (always!) and the embellies here! My word!!!! How do you spell beautiful? Just look at this card and you will know. Absolutely gorgeous. So many different elements and they all work together like a charm. Beautiful art work! Absolutely gorgeous card.. Love everything about it... so many accessories and your Tilda is so perfect.. Just a perfect work of art..
Merci de suivre mon voyage dans le monde du blogue. Souris à la vie! - Projet personnel - Simple à Souhait.